A charity very dear to our hearts is LovingHumanity – we have supported Amy from the start and help financially where we can. 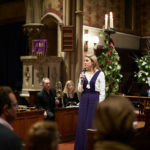 In December 2018, Amy spoke passionately and movingly at the LiveTwice carol concert and the congregation gave very generously wanting to support her invaluable work. Founded by Amy Peake in 2014, Loving Humanity aims to alleviate health problems associated with the lack of good quality and affordable sanitary pads. They aim to restore dignity and create social uplift by creating employment for groups of women refugees. As well as providing sanitary pads, Loving Humanity also manufacture reusable nappies and incontinence pads too. 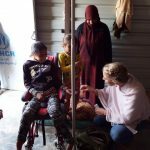 LiveTwice are pleased to have been able to continue to support the vital work Amy and her team are doing across refugee camps in Jordan, Turkey and beyond. Loving Humanity have recently opened their own factory – a great moment and something Amy has been working tirelessly towards. They now employ 15 widows in the factory which has changed the lives of those who work in our factory in every possible way. UNHCR have provided people to help the project which has been a huge help with the distribution of stock to the schools with sanitary products. It’s a huge undertaking; in one school alone, there are over 100 girls who need help and there are 9 schools. Another group the charity are able to help is families with children aged 2-3. 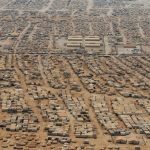 The distribution of disposable nappies in the camp stops at the age of two, at which stage the parents must spend precious money on nappies or suffer the arduous task of cleaning all the bedding every day. The incredible work of Loving Humanity has been recognised by the United Nations and has been put under it’s protection programme for women. It is the first of its kind in the world and the feedback from the women and the success of this project has been and continues to be phenomenal; – not only ensuring dignity for women, but the wages earned by women working in the factory has transformed their lives in the camp.